All Hand Built in the USA using superb Tone Kraft USA materials. Pickups are custom built and shipped within four business days. Add a superb trem to your Tele for versatility with any genre of music. Bakersfield Lion - Tele®/Esquire® bridge pickup. 42AWG over A5 rod magnets, plenty o' twang, some mid-range and lotsa treble on tap, yer typical vintage mid-50's Tele® pup but without the shrill treble, about 6.8k dcr. LOTS of treble tone, some midrange pops out, some bass is recognized, serious twang on tap. This is pretty much a classic Tele® bridge pup where the tone pot can be used to rein in the treble on occasion. Black or ivory/parchment string wrapped, supplied with mounting screws and tubing. Nocaster Lion - Tele®/Esquire® bridge pickup. 43AWG over A3 rod magnets, approximately 10.2k dcr - that original classic earliest vintage 1950/51 Fender® Esquire®/Broadcaster/Nocaster tone is back and fattened up with a higher turn count to squelch the shrill treble. Twangy, thick, clean, clear, with no ice-pick-in-the-ear. Black or ivory/parchment string wrapped, supplied with mounting screws and tubing. 51/52 Lion - Tele®/Esquire® bridge pickup. 42AWG over A3 rod magnets, the "transitional" pickup. 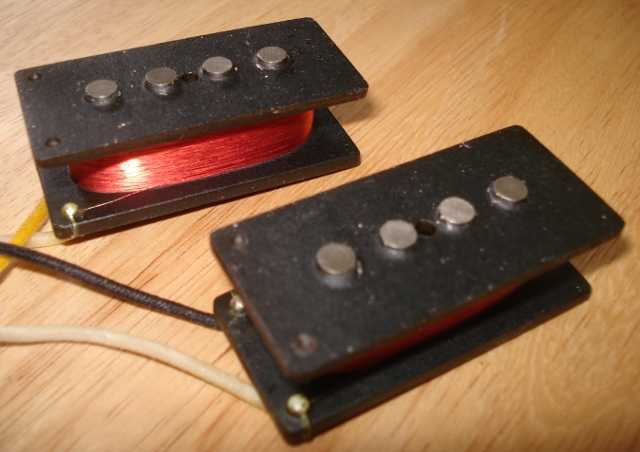 During 1951 and 1952 Leo Fender began phasing out the A3/43AWG Tele®/Esquire® bridge pickup by using existing A3 rod magnets along with 42AWG coil wire. Sometime after 1952/53 that transition ended with the standarized use of A5 rod magnets and 42AWG coil wire. The 51/52 Lion has a bit more midrange than the Nocaster Lion, and plenty of twang, about 7.8k dcr. Black or ivory/parchment string wrapped, supplied with mounting screws and tubing. Nashville Lion - Tele®/Esquire® bridge pickup. 42AWG over A5 rod magnets, lots of country twang with a hefty dose of mid-range, think "Broadcaster plus", this is the original Cavalier Lion that's quite at home for country, rock, pop and bluez - a classic higher turn count 50's Tele® bridge pickup, about 8.2k dcr. Smooth treble that's hardly shrill, good midrange and some bass end, good fat twang, arguably the most sought after Tele® bridge pup for country and lots of other genres. Black or ivory/parchment wrapped, supplied with mounting screws and tubing. Fat Lion - Tele®/Esquire® bridge pickup. 42AWG over A5 rod magnets for a very bold tone with lots of mid-range, for serious rock and blues, approximately 9.2k dcr. Butter smooth treble that's never shrill, major midrange and good bass end, not best nor meant for twang tone. This is typically used for rock and bluez and pop, and Esquires® that need an increased range of tone. Black or ivory/parchment string wrapped, supplied with mounting screws and tubing. Huge Lion - Tele®/Esquire® bridge pickup. 42AWG over A5 rod magnets with tons of mid-range and output for tone that's SO close to a P-90, approximately 11.2k dcr. Everything that applies to a Fat Lion applies to the Huge Lion, only taken up a significant Hefty amount. Black or ivory/parchment string wrapped, supplied with mounting screws and tubing. Humongous Lion - Tele®/Esquire® bridge pickup. 42AWG over A5 rod magnets and mega tons of mid-range, approximately 13.2k dcr. Everything that applies to a Huge Lion applies to the Humongous Lion, only more, LOTS MORE. Black or ivory/parchment string wrapped, supplied with mounting screws and tubing. Shipping for each entire USA order is $9.00 USPS Priority. USPS International 1st Class is $13.00 for Canada and $17 for the rest of planet earth. Payment accepted via PayPal for both cash and credit cards - email for money order or check payments. The Lion King - The Lion King offers unfettered vintage tone for those wishing the aesthetic look of the Tele® covered neck pickup, with more treble on tap than a typical Tele neck pickup. The thin nickel-silver mirror chrome cover is independently grounded from the coil leads, allowing phase reversal and easy hook up with ANY type of pickup select switch: 3-way, 4-way, 5-way, mega, etc. Supplied with body or pickguard mounting screws and height tubing. The Fat Lion King - The Fat Lion King offers more output and more midrange that its Lion King brother, for those wishing a bolder Tele® neck pickup tone and output. The thin nickel-silver mirror chrome cover is independently grounded from the coil leads, allowing phase reversal and easy hook up with ANY type of pickup select switch: 3-way, 4-way, 5-way, mega, etc. Supplied with body or pickguard mounting screws and height tubing. The Wolf - The Wolf is a covered Tele® neck pickup that's wound with 42AWG coil wire (instead of the normal 43AWG Tele® neck coil wire) and offers a more Strat® type of treble tone. The thin nickel-silver mirror chrome cover is independently grounded from the coil leads, allowing phase reversal and easy hook up with ANY type of pickup select switch: 3-way, 4-way, 5-way, mega, etc. Supplied with body or pickguard mounting screws and height tubing. All Lion King pickups come with a separate cover ground wire that allows the coil wires to be reversed for use in any standard or custom circuit. The Lioness - The original Tele® neck pickup was metal covered to attenuate the high end, reduce treble, and offer a more mid-range or baritone sound for rhythm playing and to offer an alternative to lugging around an upright string double bass. Within short order, Fender® invented the Precision Bass, yet still built the Tele® neck pickup with a tone blanketing thick metal cover. The Lioness frees up that great, natural single coil tone that's long been hidden under cold metal. Black tape coil covering, supplied with body or pickguard mounting screws and tubing. The Fat Lioness - The Fat Lioness offers more output and more midrange that its Lioness sister, for those wishing a bolder Tele® neck pickup tone and output. Black tape coil covering, supplied with body or pickguard mounting screws and tubing. The She Wolf - The She Wolf is an uncovered, Tele® neck pickup that's wound with 42AWG coil wire (instead of the normal 43AWG Tele® neck coil wire) and offers yet a bit more Strat® type of treble tone because there is no ground shield cover. Supplied with body or pickguard mounting screws and height tubing. 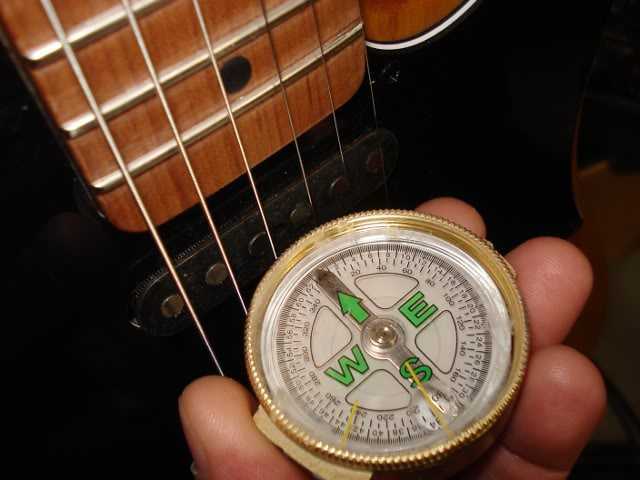 The Lion King, Fat Lion King, Lioness, Fat Lioness, Wolf and She Wolf Tele® neck pickups have a default South top polarity - the North needle of a magnetic compass will point to the top of these pickups. Reverse polarity (North top) is an option at no charge. AlNiCo rod magnets are either flush or slightly above the top, never staggered. All coils are vacuum wax potted by default to greatly minimize microphonics. Light wax potting for increased harmonics (and squealing microphonics!) is an option. 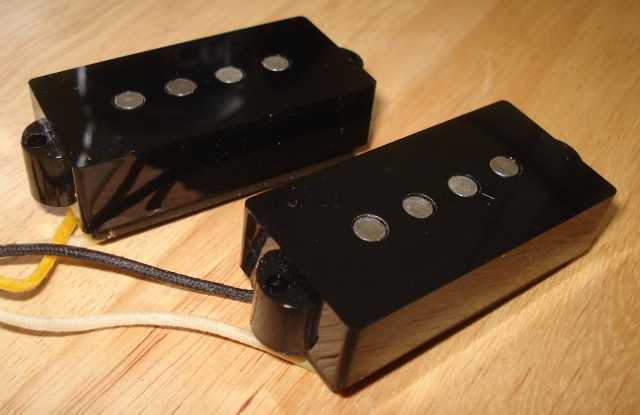 Lioness pickups are black matte tape wound, both Lion King pickups are covered. The Wolf pickup can be similarly covered or uncovered. 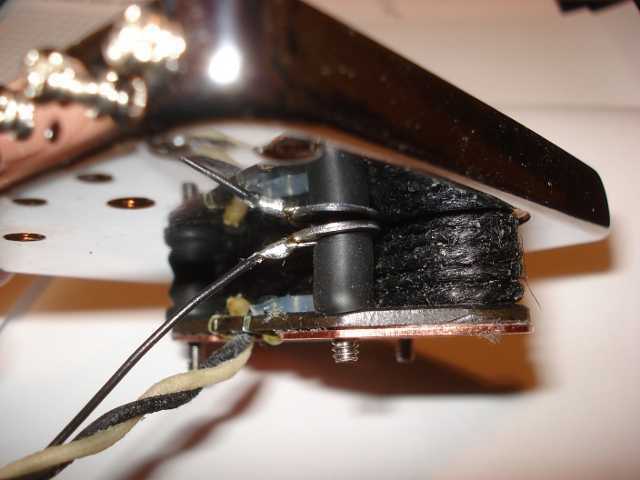 Leads are black, yellow or ivory cloth covered "push up" stranded wire. Body mount wood screws or 6-32 pickguard machine screws and height rubber tubing included. The Lion King and Lioness - 43AWG coil wire over AlNiCo 5 rod magnets, approximately 8.2k resistance. The Fat Lion King and Fat Lioness - 43AWG coil wire over AlNiCo 5 rod magnets, approximately 10.2k resistance. The Wolf and She Wolf - 42AWG coil wire over AlNiCo 5 rod magnets, approximately 6.7k resistance. Cavalier '51 P-Bass - The single coil electric bass pickup that started it all for replacing the double string bass and giving rock and country the kick in the pants it sorely needed. 42AWG over A5 rod magnets for added volume and sweeping range of tone. About 9.5k dcr. Black (default) or ivory string (optional) wrapped, supplied with body mount screws and tubing. (NOTE: for Bronco, Musicmaster, or any pickguard mount bass pickup retrofits, pickguard mounting screws and tubing can be ordered as an option). Cavalier '57 P-Bass - The next generation P-Bass pickup that's dual coil and humbucking. 42AWG over A5 rod magnets, about 11k dcr. Volume and tone to please the most discriminating P-Bass artist. Supplied with black plastic covers, body mount screws and neoprene cushion height pads. All Cavalier bass pickups have a default North top polarity - the South needle of a magnetic compass will point to the top of most pickups. 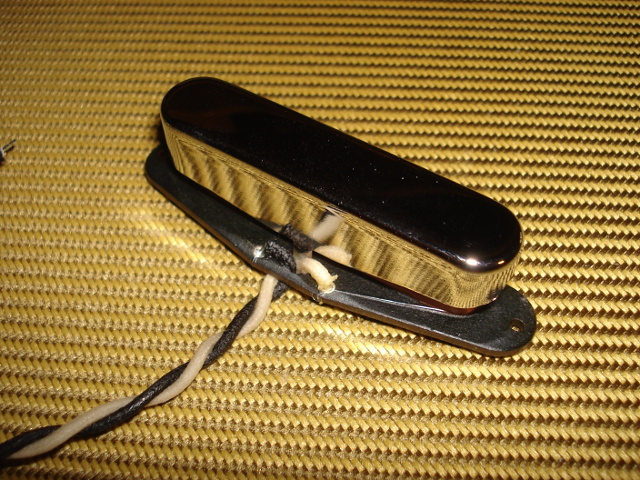 The '57 P-Bass pickup is dual coil with one coil built as RWRP, for series humbucking. Polarity changes on any Cavalier is an option at no charge. All coils are vacuum wax potted by default to greatly minimize mircrophonics. Light wax potting for increased harmonics (and microphonics) is an option. Leads are black, yellow or ivory cloth covered "push up" stranded wire. Black plastic covers for the '57 P-Bass included. Wood mounting screws and height rubber tubing or foam pads included. Cavalier Pickups Build - Cavalier Tele®, Esquire®, and '51 P-Bass® pickups are all built to respective vintage footprint specifications and all will properly fit into Fender® guitars and basses, or any guitars/basses built to Fender® pickup footprint specifications. I hand build all Cavalier bobbins with vulcanized fiber board flatware, AlNiCo V or III rod magnets, hand guided 42AWG or 43AWG coil wire using a custom coil winding machine of my own build, with Red Lion infrared trigger and digital counter. 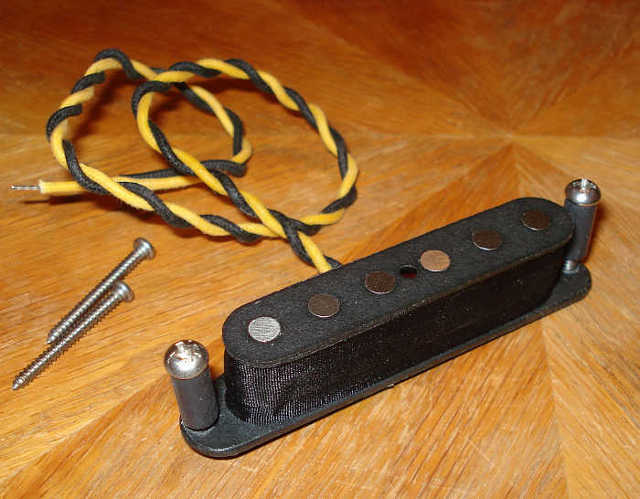 The Lion bridge pickup has a steel base plate and its wire coil is wound with cotton string. 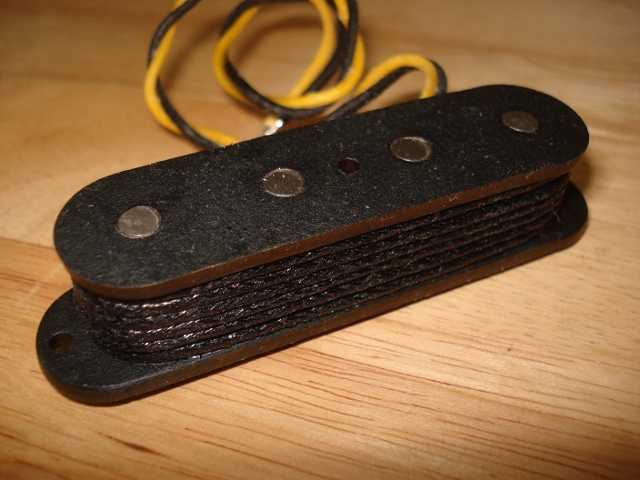 The Lioness and Fat Lioness Tele® neck pickup wire coil is covered with black matte tape. The Lion King Tele® neck pickup has a choice of metal covers. 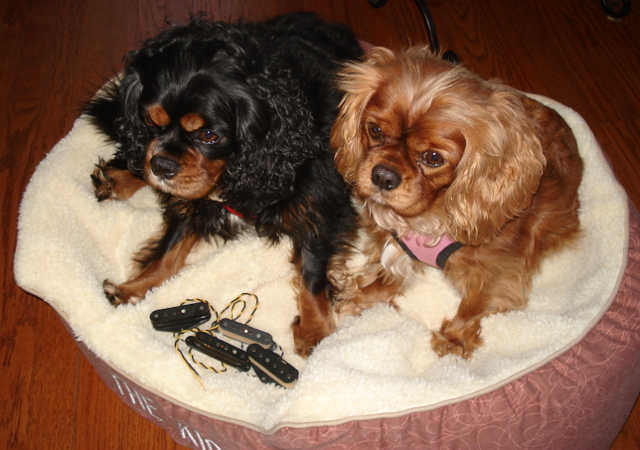 All Cavaliers have cloth covered lead wire, and are vacuum wax potted (default). Light wax potting for increased harmonics (and squealing microphonics!) is an option. After the bobbin has been assembled, the pressed-in magnets are further bonded with wicked-in thin CYAnoacrylate super glue for added bobbin strength. 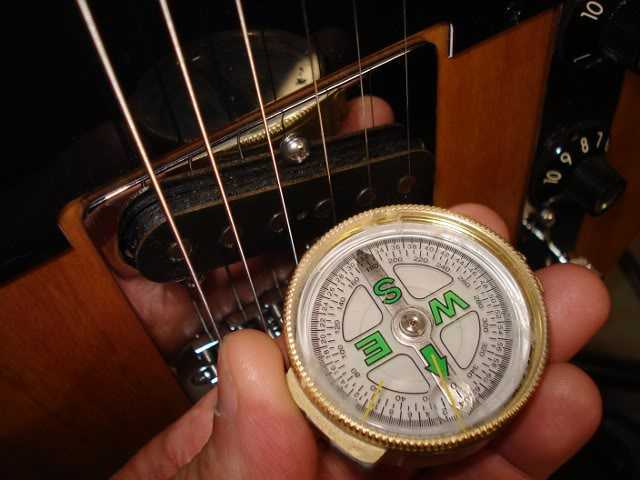 Pickup Polarity and Wind Direction - Unless customer specified, all Lion bridge pickups are wound counter-clockwise and are top North poled (a magnetic compass South needle will point to the pickup's top), the Lion King, Fat Lion King, Lioness, and Fat Lioness Tele® neck pickups are wound clockwise and are top South poled (reverse polarity, or RWRP, from bridge pickups to allow noiseless parallel humbucking mode when both pickups are selected). As with most vintage style single coil pickups, the pickup height distance between the top of the pickup and the guitar strings is critical to tone - closer to the string for more volume and punch, further away for less volume and more acoustic sweetness. Lion Tele/Esquire® bridge pickups have unusually high coil wire turn counts, therefore their tall bobbins are packed full. Take care installing a Lion into its bridge mount, insuring the string wrap and wire beneath it aren't crushed. WARRANTY - Cavalier Pickups warrants that its products are free from defects in materials and workmanship for LIFE (the original owner), and will repair or replace any part which (under normal installation and use) discloses such defects, if the product is returned to Cavalier Pickups with prepaid shipping charges, and provided that the product, upon examination by Cavalier Pickups, discloses that it is defective. This warranty does not extend beyond the original purchaser, nor to any Cavalier Pickups product which has been damaged by misuse, accident, incorrect wiring, improper installation, use in violation of the instructions, tampering, alteration or repair outside of our domain. RETURNS - The Cavalier return policy is simple - there is NO return policy, unless there is a verified build defect (see Warranty). DO NOT RETURN MERCHANDISE WITHOUT FIRST CONTACTING CAVALIER PICKUPS. Communication is everything.